In this week’s News You Almost Believed, the fake news brigade targets former President Pranab Mukherjee. Former President of India, Pranab Mukherjee became the target of the fake news brigade as he broke convention as a former Congressman and accepted the RSS’ invitation to attend a convocation ceremony. 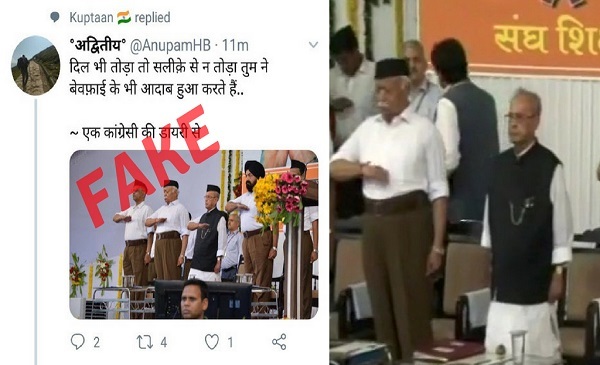 Barely hours after Mukherjee spoke at the RSS event in Nagpur on Thursday evening, a photoshopped image of him appeared on Twitter. The image shows him wearing a black head gear, similar to the one worn by the RSS Chief Mohan Bhagwat and doing the RSS salute. The photograph was enough confirmation for Mukherjee’s daughter who had publicly warned him about being a target of fake news. Read the full story here. 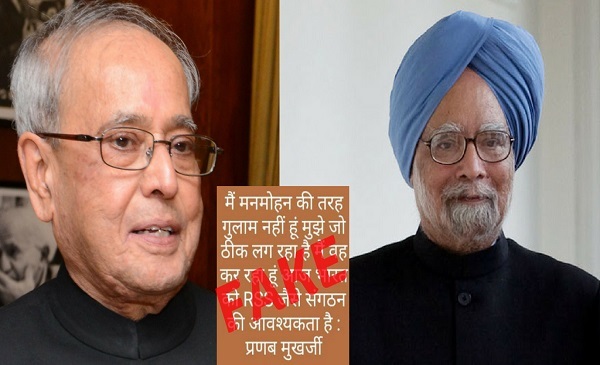 Even before the June 7th event, a fake quote in Hindi attributed to Pranab Mukherjee was viral on social media. The fake translated as, “I am not a slave like ManMohan Singh. I am doing what what I feel is correct. Today, India needs an organisation like the RSS.” But speaking to BOOM, Pranab Mukherjee’s office has called the quote “Absolutely rubbish”. The team clarified that Mukherjee has not given any such quote at any event or to any journalist and it was clearly a fake. Read the full story here. Earlier in the week, a video from Mizoram claiming Christian Missionaries burnt a Hindu idol and the Indian flag went viral on social media. BOOM spoke to local police who confirmed that the incident is from September 2017 and those involved were arrested and are awaiting trial. 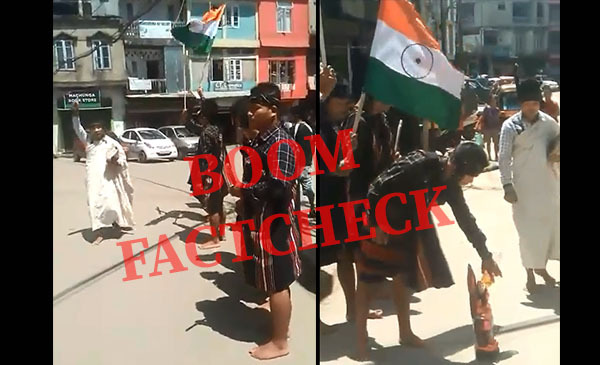 However, the police stressed that the group seen in the video is a fringe outfit made up of Christian fanatics and are not associated with any church in Mizoram. Read the full story here. 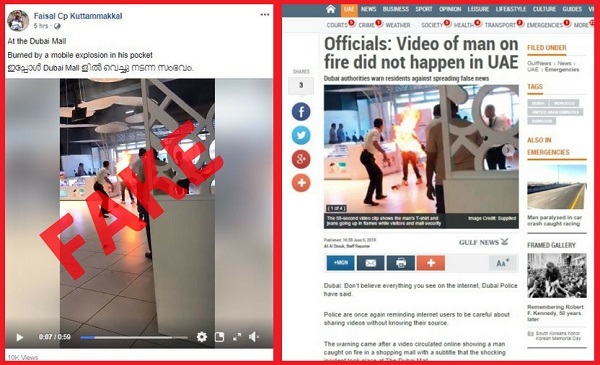 A shocking video showing a man on fire at a supermarket has gone viral in Dubai and India with a false context that the fire originated as the man’s cellphone exploded. However, a fact-check revealed that the video was taken in Morocco and not Dubai. The man immolated himself after security personnel at the mall foiled an earlier attempt by him to shoplift and made him pay a hefty fine. Read the full story here. A Times of India newspaper front page clipping is being shared on social media claiming the Bharatiya Janata Party government in Uttar Pradesh has passed a law that introduced 6% GST on Sunday church offerings. 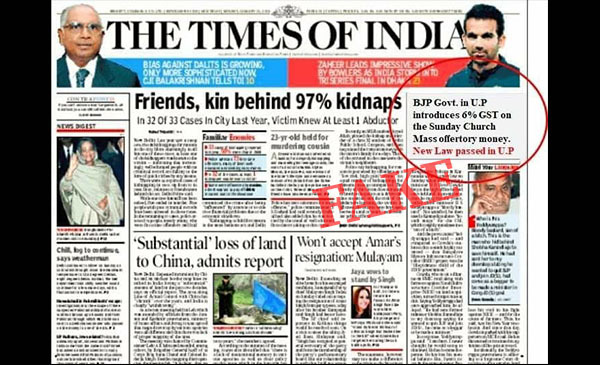 However, a fact-check revealed that the image is photoshopped, the news articles in it date back to 2010 besides goods and services tax or the GST is not a state levied tax. The central government cleared tax law passed by both houses of the parliament has 5 slabs -5%, 12%, 18% and 28%. Read the full story here. 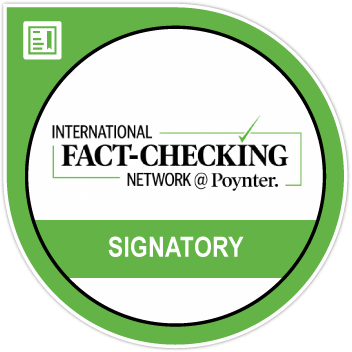 You can watch BOOM’s Jency Jacob and Suyash Barve discuss all these stories on our show Fact vs Fiction.